Before we move to our showcase of free portfolio WordPress themes, let’s see what the key characteristics of a good portfolio are. First, it should immediately identify who you are and what you deal with. Next, when future clients land on your page, they should easily be able to locate all contact details. So, make sure you highlight your email address, phone number, links to social media accounts, and other information in a prominent way. And finally, the most important part, your online portfolio website should be designed to bring your works to the foreground. 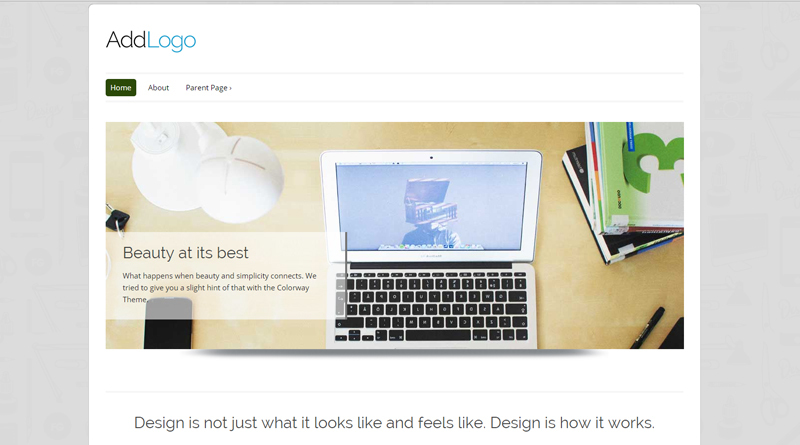 There are many free and premium website templates out there for WordPress. We have gathered together 20 of the most functional and beautifully-designed themes. These will be suitable for showcasing a photography portfolio, design project, real estate, etc. 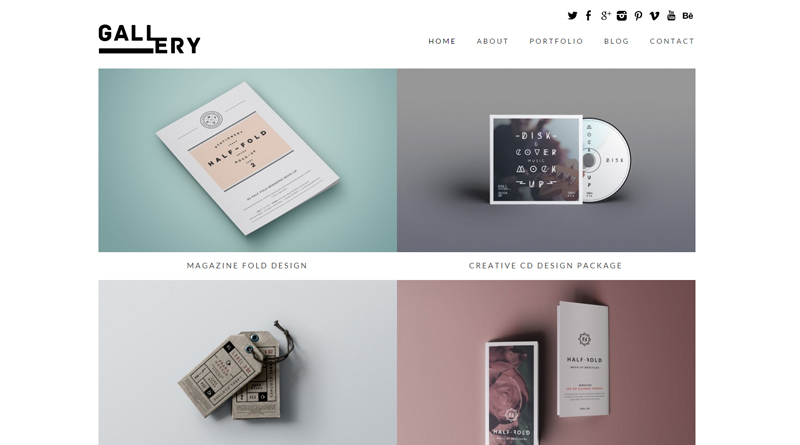 If you need more examples of well-coded WordPress themes, then please check out this gallery. 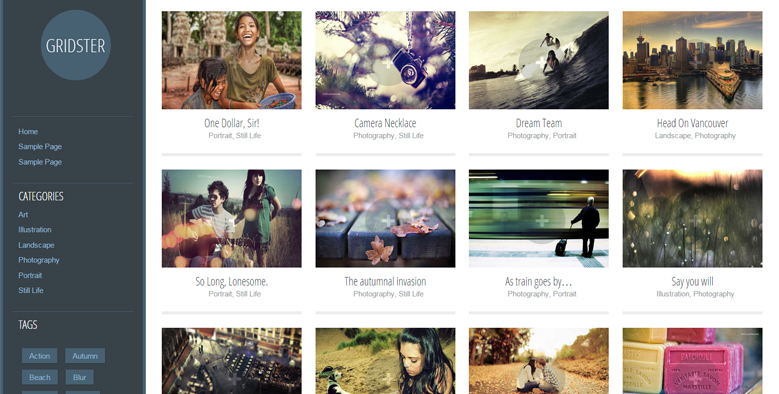 Melissa is a free photography WordPress theme created with the latest web design trends in mind. To make your portfolio site more captivating, Audio Player, Video Integration, Accordion/Carousel/Isotope sliders are provided. Developed by TemplateMonster’s creative team, the template features such advanced functionality as Cherry Framework and Bootstrap support. Melissa is WPML ready, so you should encounter no difficulty in reaching international markets. 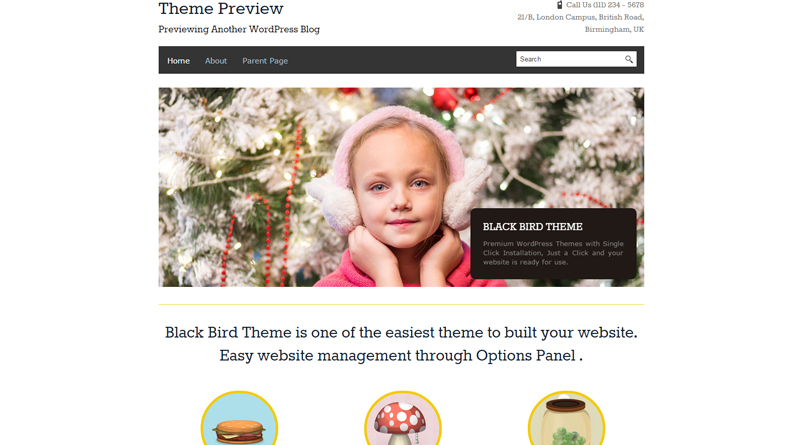 Blackbird is a free WordPress template from InkThemes. It features a responsive layout with the primary focus on content. Simple and minimalist, Blackbird is mobile-friendly and clutter-free. There is enough space for sharing any content that is important for delivering your business message effectively. 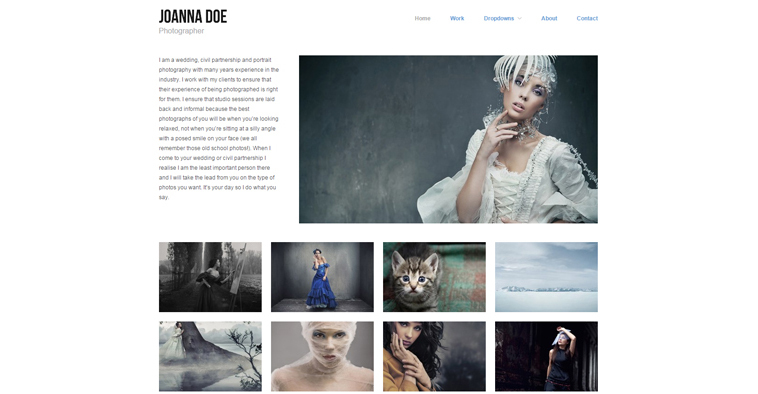 Portfolio WordPress Theme is a minimalist design for designers and photographers. Its fully responsive layout will flawlessly adapt to any screen size. 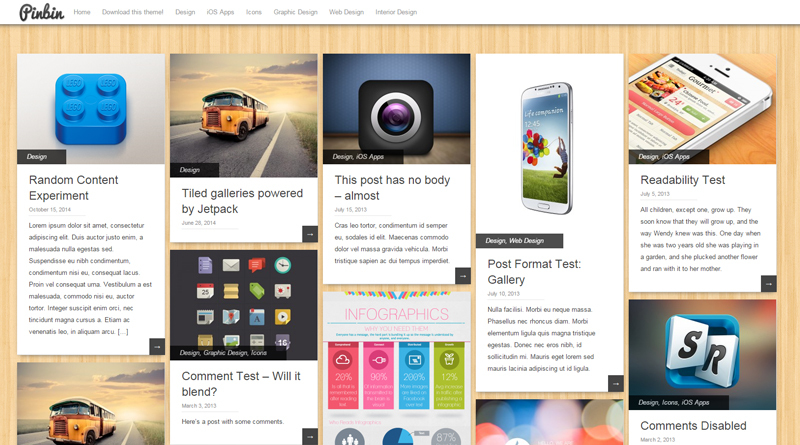 Theme Customizer includes many awesome features that premium designs commonly boast. These include Disqus support, social media links, huge collection of Google fonts, different color schemes from which to choose etc. Portfolio Press is a 100% responsive free WordPress theme for showcasing various creative projects. Thanks to its light color scheme and smart usage of negative space, you can easily draw users’ attention to your works rather than heavy design elements. 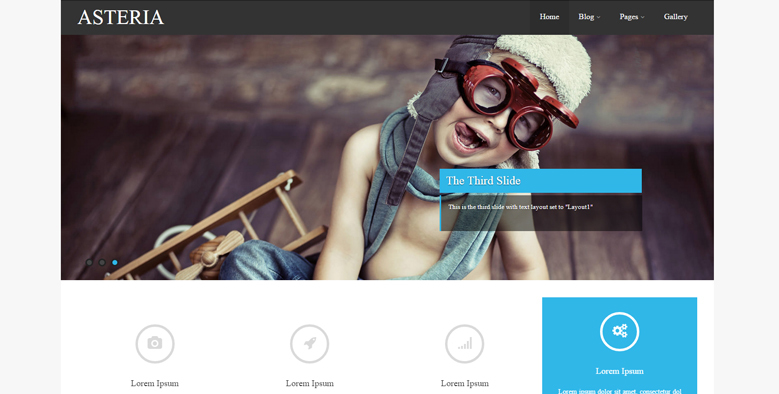 Colorway is an easy-to-install WP theme. It comes pre-loaded with default texts and images, which you can easily customize in a matter of clicks. Its clean interface boasts many top features that can come in handy for developing a blogging platform or online portfolio. 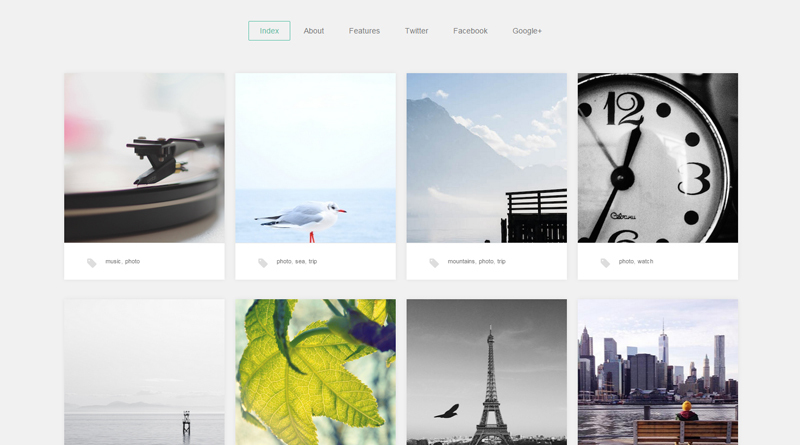 Gallery is another free WordPress theme with adaptable design. It features a tile-based layout, which makes it easier to organize plenty of content on one page. Along with portfolio functionality, the theme comes loaded with blog support. Thus, you can keep your followers updated on the latest news. Every element of this design can be changed to fit your business perfectly. At its name implies, Pinbin has a Pinterest-inspired design. The theme uses pastel backgrounds and is built with valid code. Its layout will be properly displayed on any screen size. Need to upload your own logo? Not a problem. This can be achieved easily with the help of the integrated WordPress media manager. Clean and minimalist, with the main focus on visuals, Catwalk would be a perfect solution with which to build any creative portfolio. Best suited for model agencies, art & photography and design studies, it can be easily customized to fit many other purposes. Custom admin panel and advanced theme options should help you with that. Pictorico looks very trendy. Its full-width layout will smoothly adapt to any screen resolution. Grid-based content organization, images with hover effect on mouse over as well as integrated live search facilitate navigation. The theme can be customized with a different background photo or color, custom header, menus, and more. 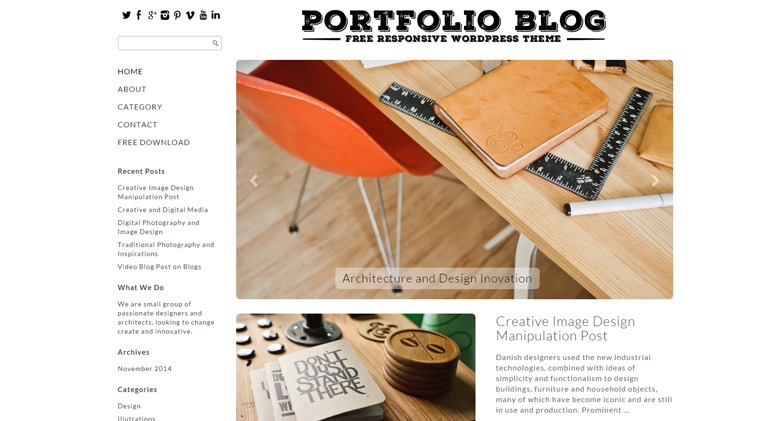 Portfolio Blog is a free responsive WordPress theme featuring a clean and minimalist design. The vertical main menu as well as social sharing options, categories menu, and newsletter sign up form were moved to the left. Contrasting with the light coloured background, the header slider and featured content look more prominent. Users of desktop and handheld devices will equally enjoy this responsive and touch-friendly design. 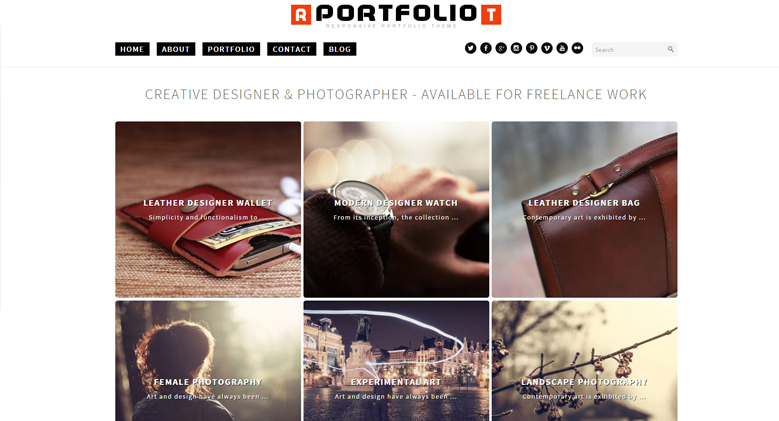 Portfolio is a responsive WP theme for photographers and others with creative activities. It features infinite scroll technique to captivate your viewers’ attention with interactive storytelling. Its Retina-ready images will look sharp on the latest generation devices. Thanks to its SEO-friendly layout, your site will rank high in the major search engines. Touchfolio features a very unusual navigation, with the main focus on content and photography. To browse multiple libraries all you need to do is swipe up or down. To take a closer look at what each library contains – swipe right or left. Its mobile-friendly layout is SEO-optimized, so you shouldn’t have any issues with page ranking. 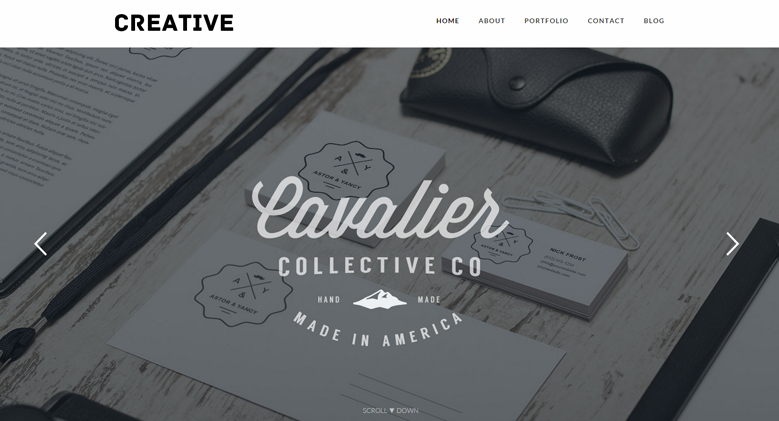 Creative agencies will become more noticeable when their websites are built with this free WordPress theme. Featuring a full-screen layout, it includes every element to present your business in the best possible light. Navigation has been made simple and intuitive. Video integration, quality visuals and awesome sliders make this design really captivating. 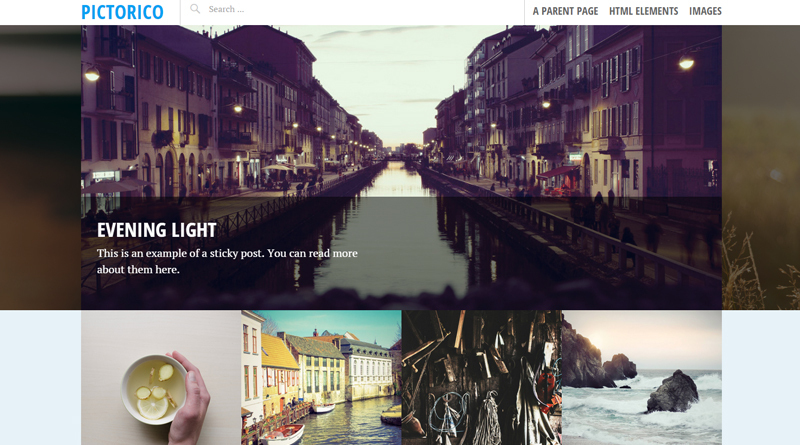 Hatch is a mobile-friendly free WordPress theme optimized for art and photography projects. Its layout is simple yet modern, with the main emphasis on visuals. 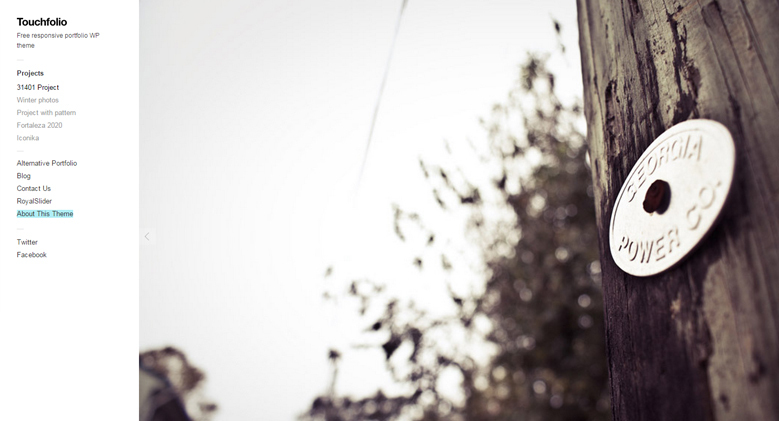 Are you targeting international markets? This translation-ready theme will suit your purpose. 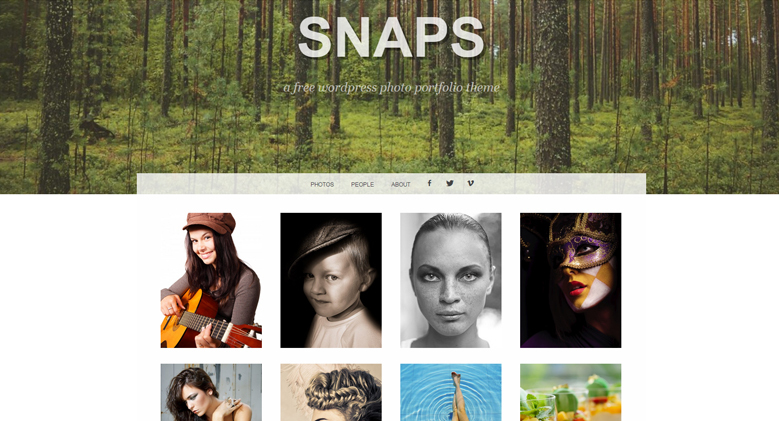 Snaps is the next freebie perfect for showcasing your portrait images and galleries. Due to robust theme options, you can seamlessly customize any element of this design. Translation-ready and mobile-friendly, Snaps boasts custom backgrounds, page templates, widgetized sidebar, custom menus, all modern browser support, and more. Asteria is a well-coded WP theme featuring a beautiful slider, hover effects and a grid-based content structure. 3 page templates, 600+ fonts and 10 social icons along with Maintenance Mode feature, Custom CSS feature, and many other handy functions provide for seamless and hassle-free customization. Gridster is a sleek, free, WP theme with grid-based content organization best suited for photographers, artists and designers. All navigation elements are organized in a vertical view, providing visitors with quick access to all the major categories on your site. 100% responsive layout will automatically adjust to any screen size on which it is being displayed. 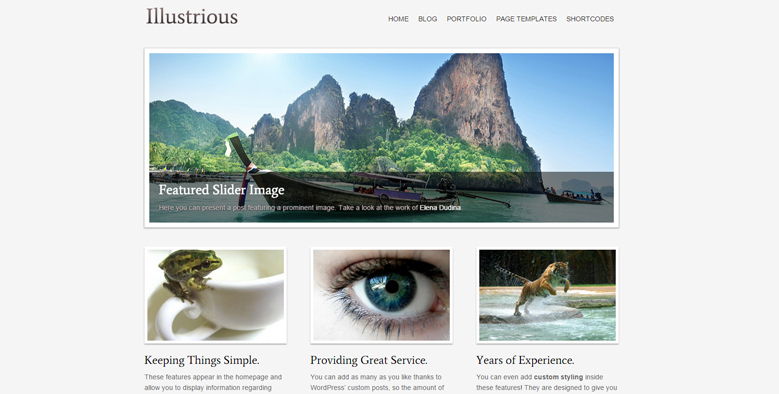 Showcase your portfolio in a striking way with the help of Illustrious free WordPress theme. If you view the live demo, you can see that the homepage is photo-centric, with the main emphasis put on slider and photo galleries. In addition to blog and portfolio functionality, the theme boasts WooCommerce support, which makes it easier for you not only to showcase your works, but also to sell any stuff online. Thus, you gain more recognition and boost sales. 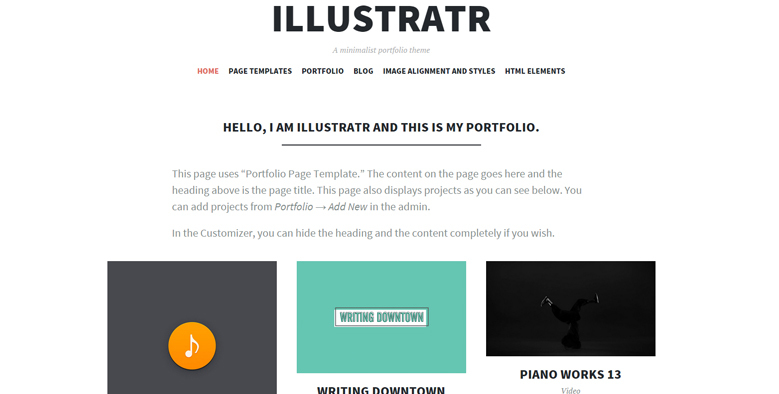 Though Illustratr is a free WordPress template, its characteristics don’t lag behind its premium peers. Responsive design, Portfolio feature with unique layouts, portfolio shortcodes, featured images, custom menu, socials icons, and widgets make it an indispensable solution for building a competitive online presentation. If you need to integrate your portfolio website with blog functionality, then take a closer look at Portfolium. This is the last but not the least of the themes on this list. 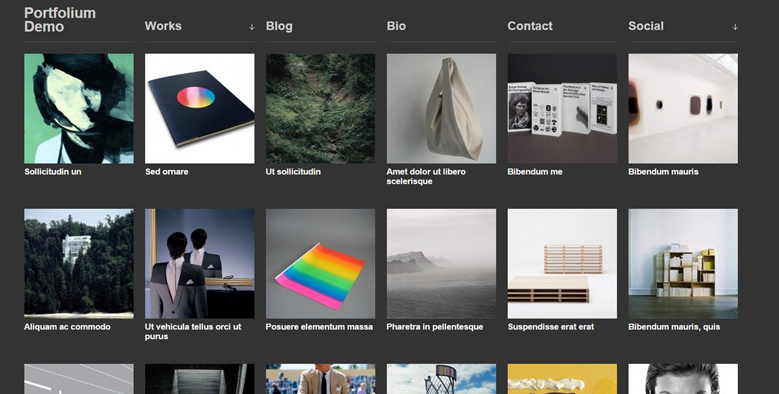 Grid-based layout looks neat and balanced; a perfect option for sharing lots of information on a single page. That’s all for today. We hope that some of these templates are good enough to be added to your own collection of free web design stuff. 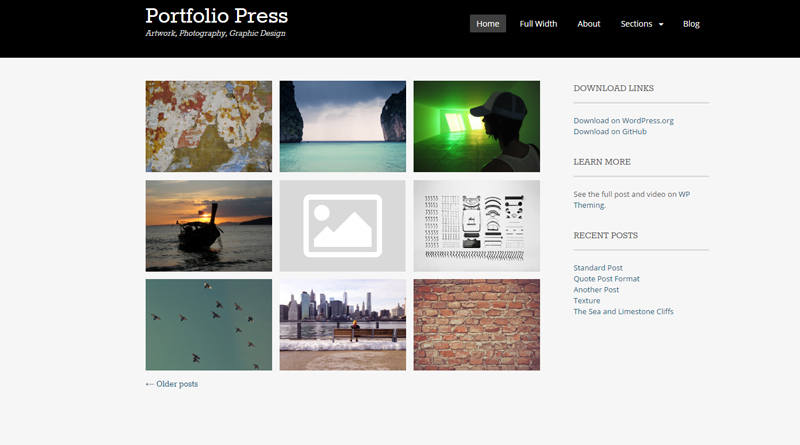 Feel free to download these to enhance the feel and look of your online portfolio. If you know of any other cool free WordPress themes, you are welcome share your thoughts below this post. Written by Katherine Crayon, copywriter reporting on tech news and all aspects of the web design industry. Anyone looking for more inspirational posts, tips and advice or simply the latest industry news, meet her in person on G+ and Twitter.